This is what we currently have in-stock; we try our best to keep this updated. 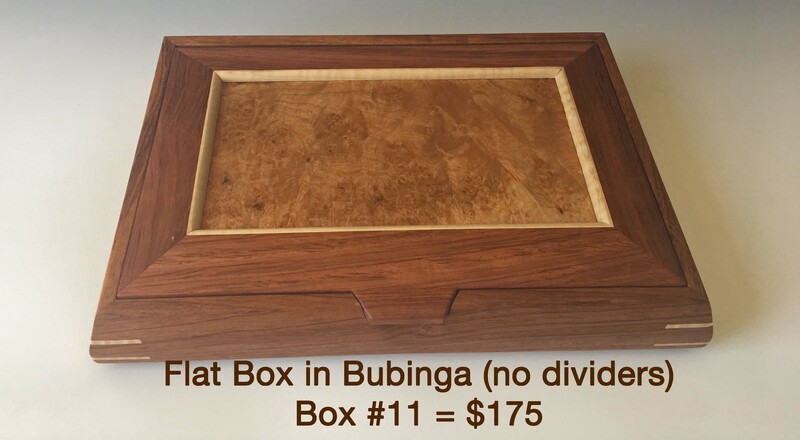 If interested, please fill out our contact form and mention which box in which wood, and its corresponding box number. 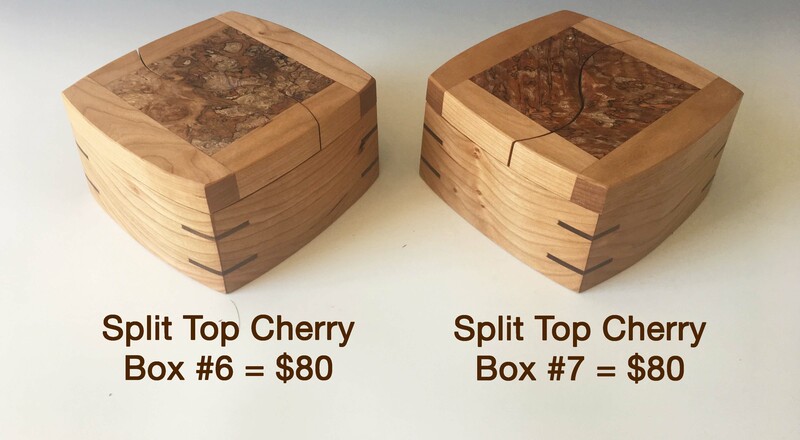 This wooden keepsake box is what I call my "Split Top" box. 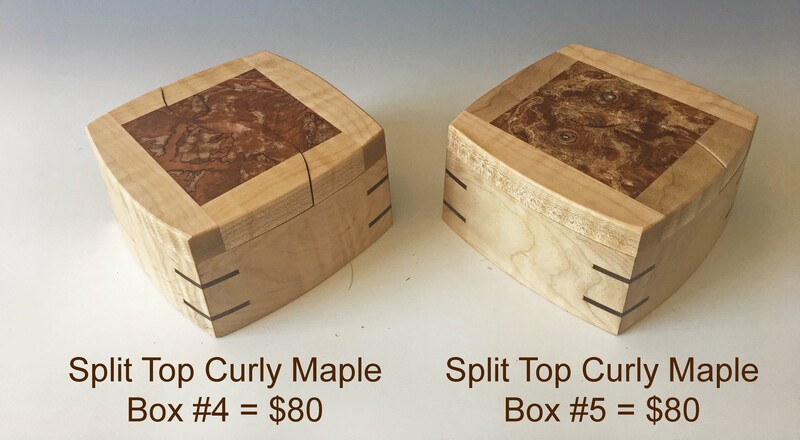 It is the smallest box that I offer, and can be used for a variety of items. 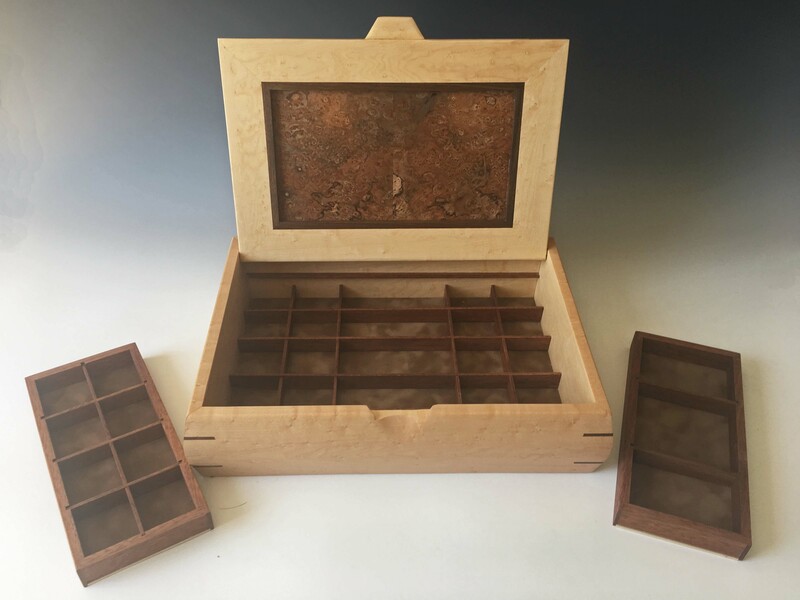 It can be used for a small amount of jewelry, special keepsakes, or as a box to hide unsightly daily things such as keys, change, or power cords for electronic devices. 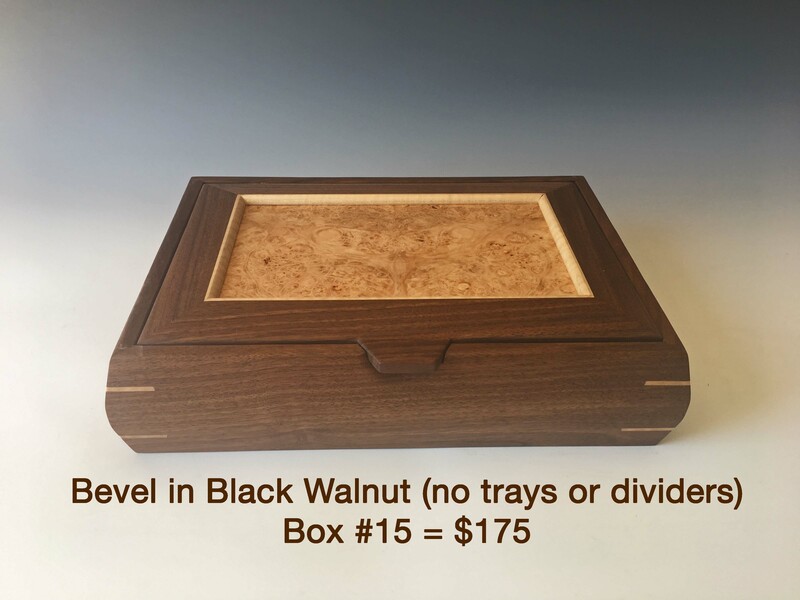 The box measures 6" wide by 6" deep and 3" high; so it is perfect for storing just a few small treasures, or perhaps small but precious mementos. The interior bottom is lined with Super Suede. 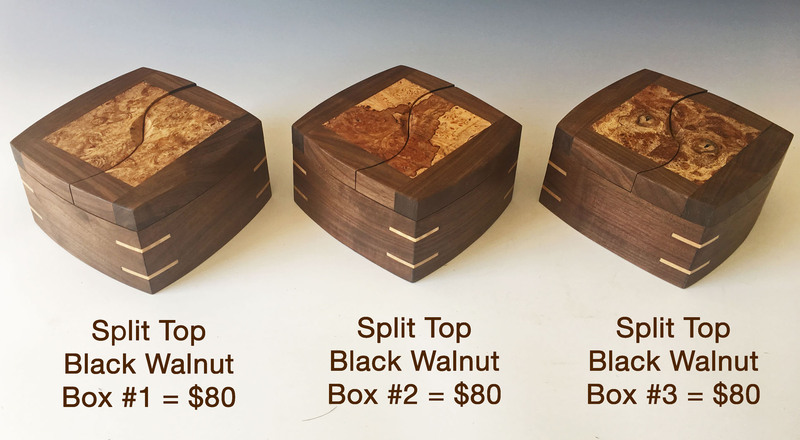 This particular handmade jewelry box is what I call my Flat Box. 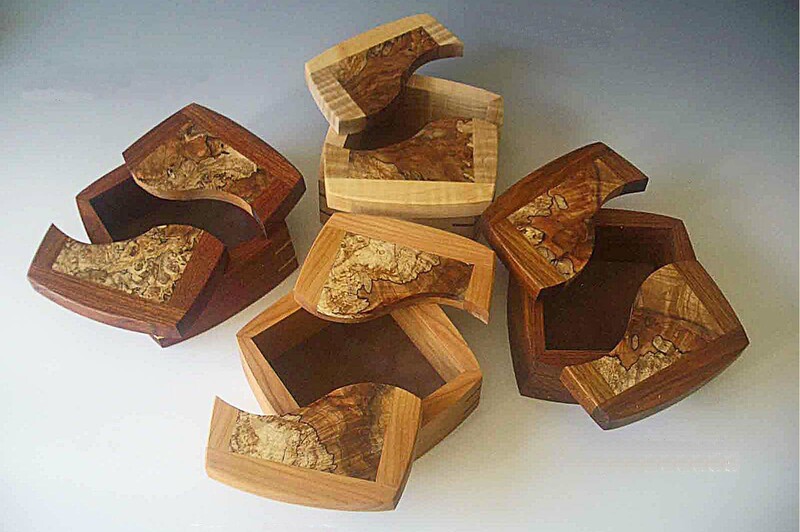 It is one of my most versatile boxes in the sense that it works as equally well for men or women. 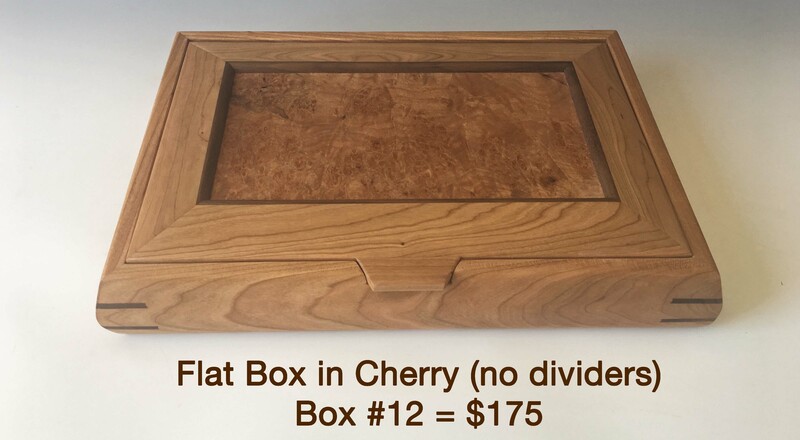 Since this box is not very tall, it doesn't demand a lot of room (it measures 15" wide by 10" deep and 2.5" high). 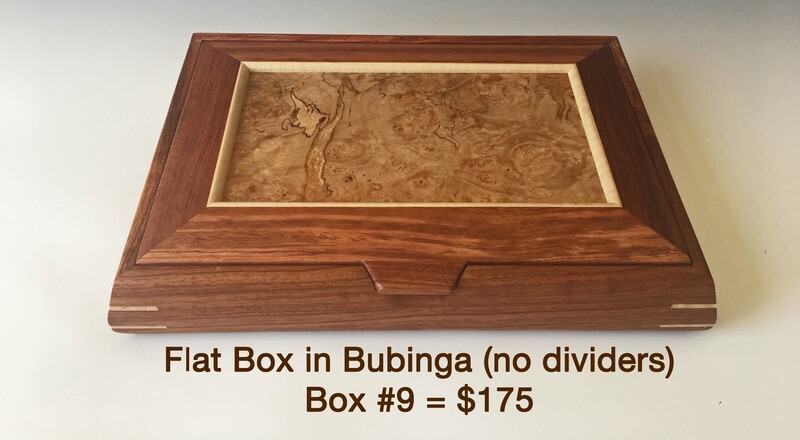 It can easily be stored away; however, the beautiful patterns of the burl lid will make you want to display it wherever you can. Each is an open box on the inside. 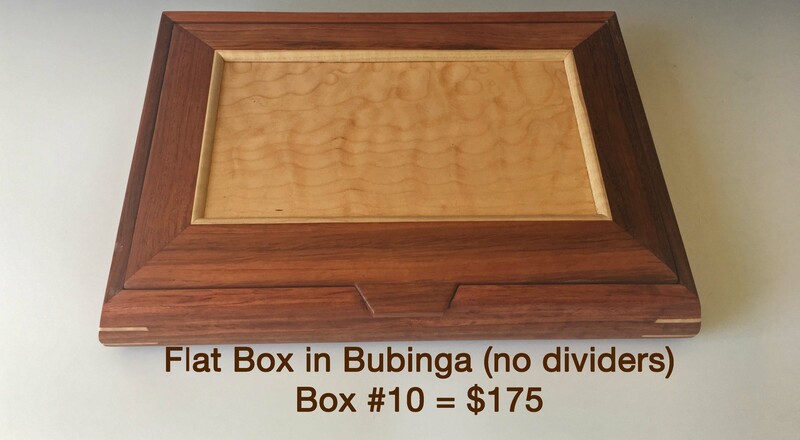 This makes it a great box for storing photos, cards, kids' drawings, or remotes and unsightly device charger cords. 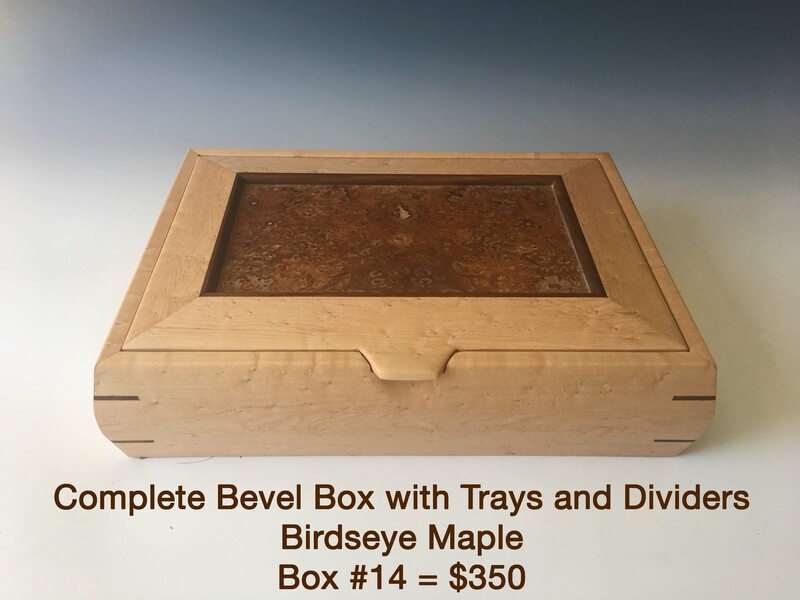 To see how this box can be used without the dividers, please click here. 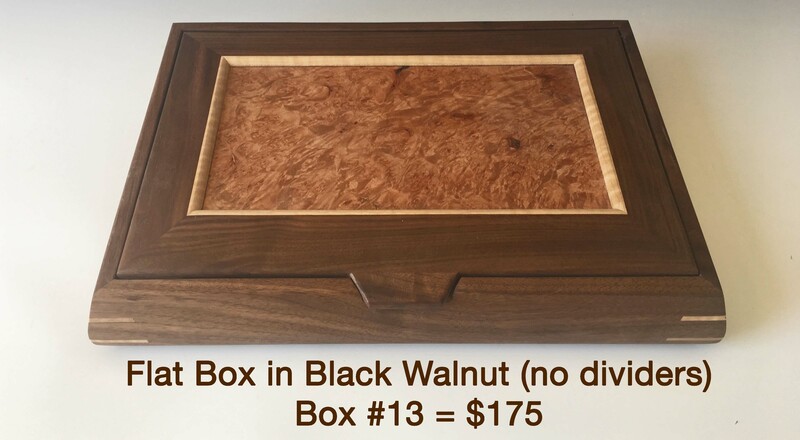 This is one of my jewelry boxes that works just as well as a jewelry box for men or women. It measures 15" wide by 10.5" deep and 4" high. The lid lifts up to reveal two tiers of jewelry storage. 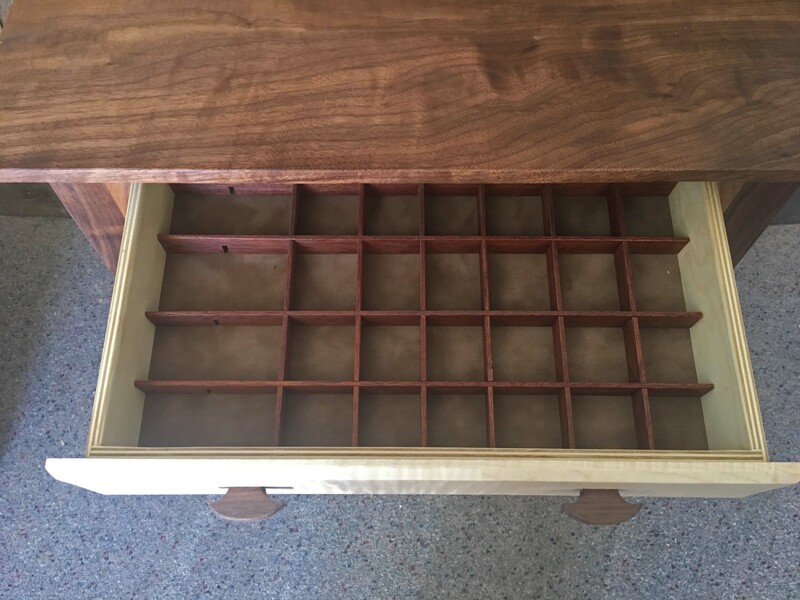 On the top layer there are two sliding trays with dividers; they slide in either direction to allow access to the level below. 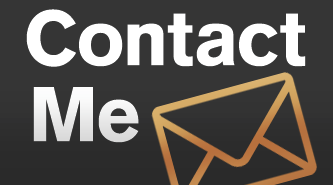 This allows for a large amount of storage in a relatively compact space. 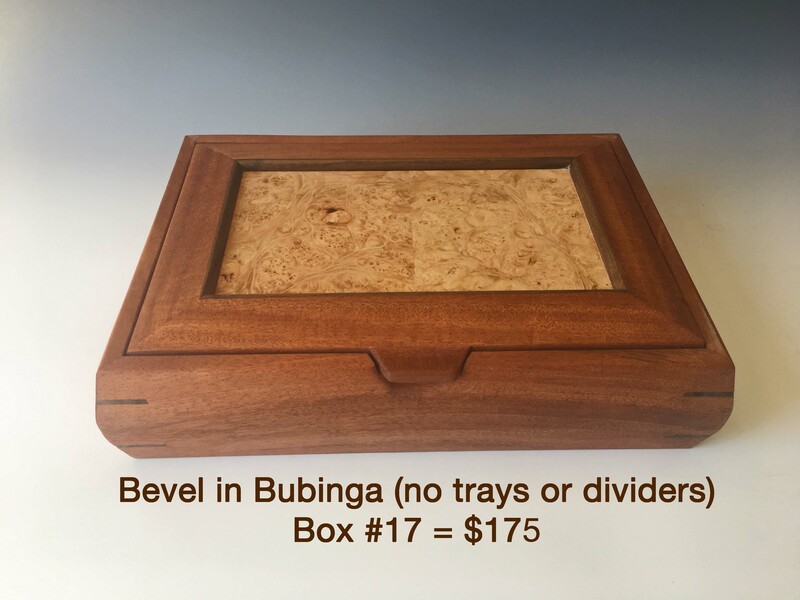 Again, please note the following are my bevel design without the trays and dividers (the interior bottom is lined with Super Suede). 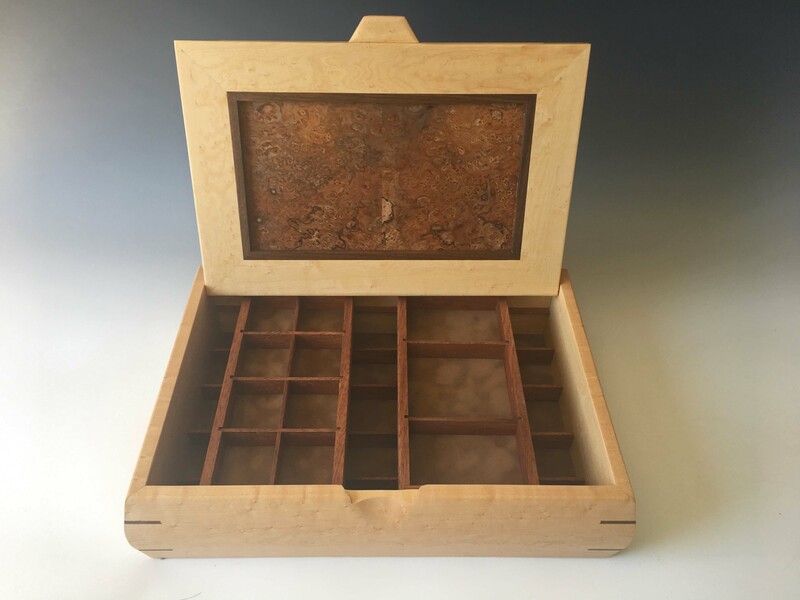 These make beautiful storage boxes that can hold remote controls, cell phone chargers, kids' drawings, mementos, or desk items (such as staplers, pens, etc). 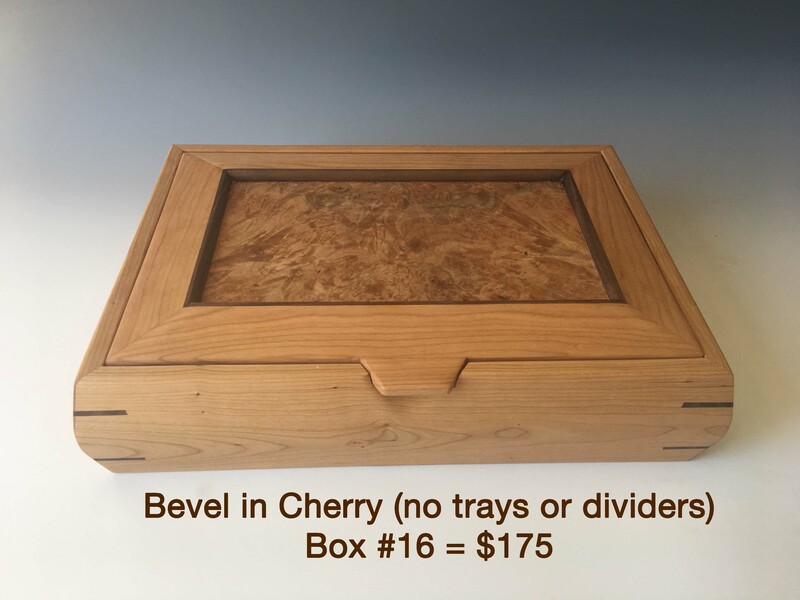 Each bevel measures 15" wide by 10.5" deep and 4" high. 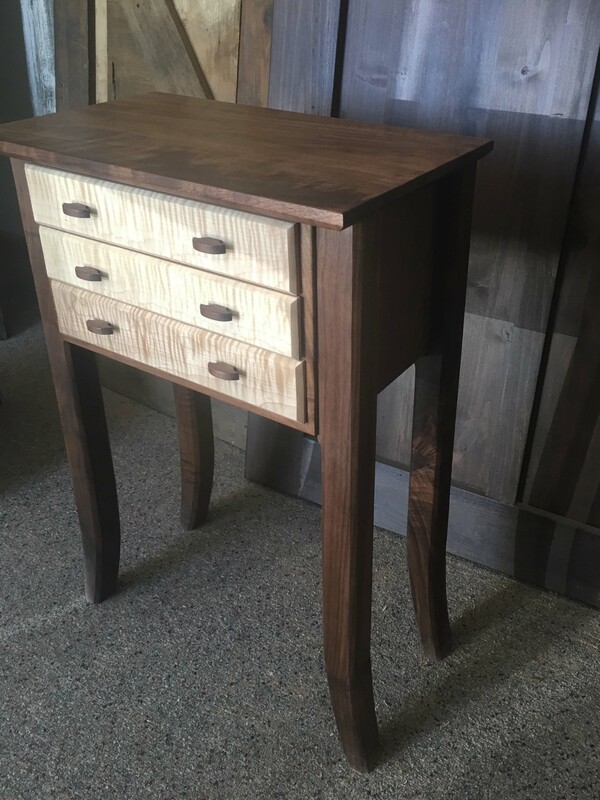 This unique piece can be used as a bedside end table and also holds jewelry or mementos. It measures 20.5" wide x 12" deep x 30" high. 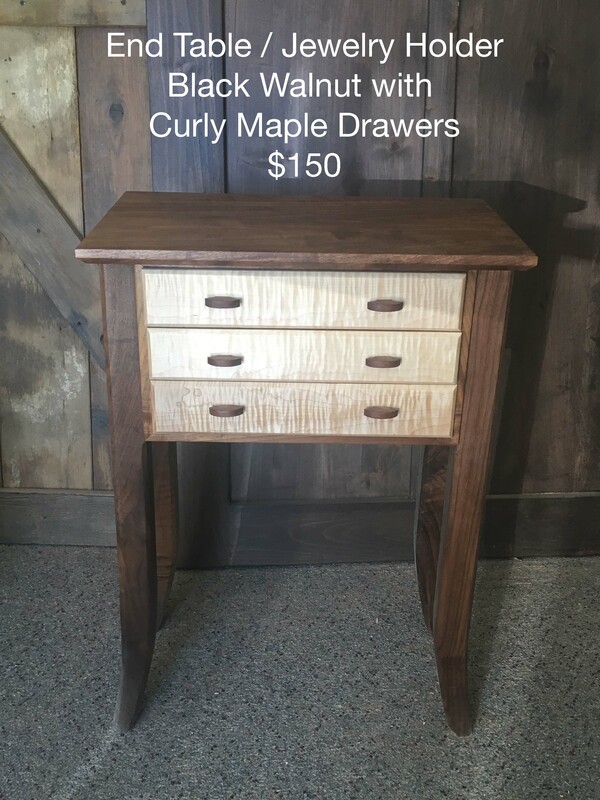 It is made of black walnut, with curly maple for the drawers. 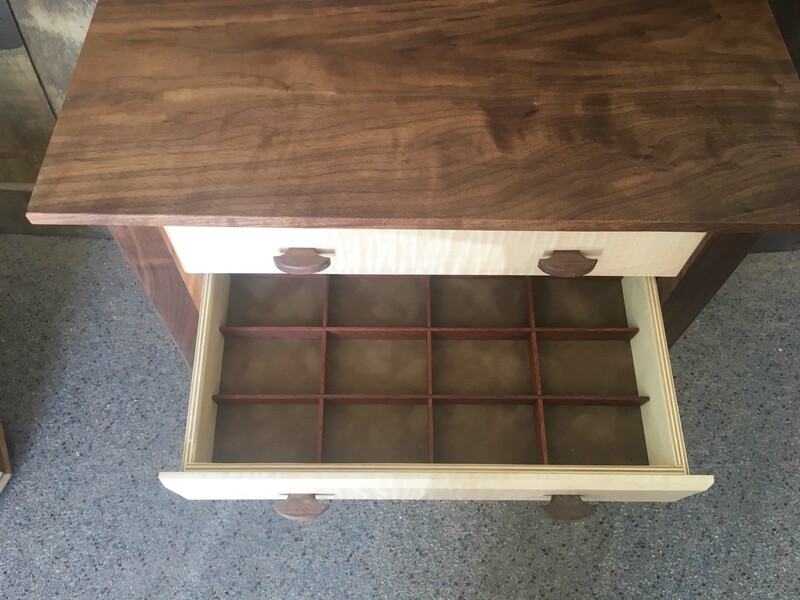 The top drawer is missing one divider bar, but the dividers are designed to pull out and arrange according to your needs.